Yahoo! Inc. (NASDAQ: YHOO) reports earnings on Tuesday afternoon. According to Estimize, Wall Street is expecting earnings per share of $0.17 on revenue of $1.049 billion. 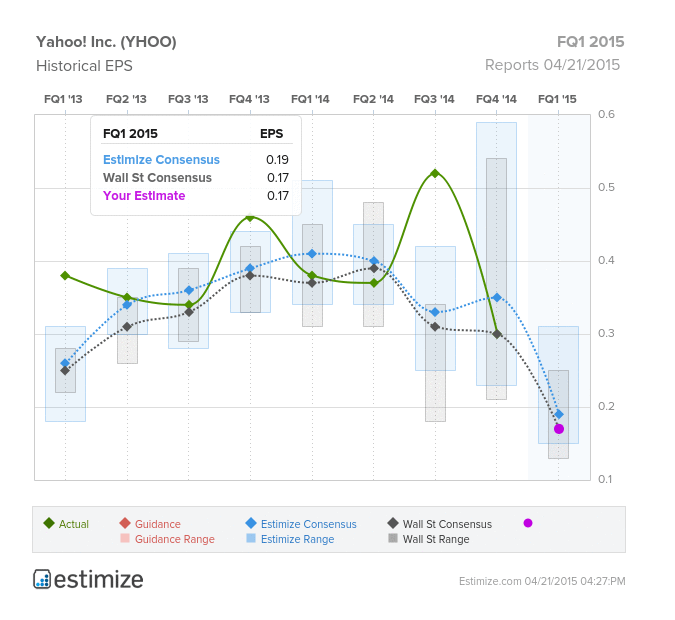 Estimize users expect slightly larger EPS of $0.19 and revenue of $1.055 billion. Yahoo has not provided earnings guidance, but predicts it will end its fiscal first quarter with revenue of $1.040 billion. The graphic below details these projections. Perhaps more interestingly, Estimize also provides a look at how estimates have changed over time. Wall Street and user expectations have fallen in the past three months -- both expected Yahoo to report a Q1 EPS above $0.25 in the beginning of 2015. Earlier this week, Axiom previewed Yahoo earnings. "We estimate...[adjusted] EPS of $0.16 compared to consensus revenues," the firm wrote, adding that it expects 3 percent Search revenue growth, and an 8 percent decline in Display revenues. 1. "Risks to IRS approval of the spin of BABA shares"
2. "Uncertainty due to timing of the spin of BABA shares"
3. 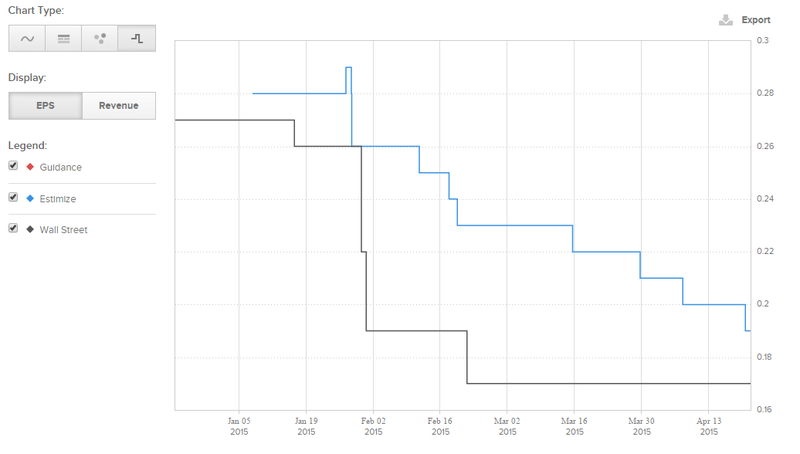 "Alibaba's take rates could remain under pressure for longer than expected"
4. "Reports of counterfeit and fake items could continue to plague Alibaba"
5. "Yahoo's initiatives to revamp the Core could fail to deliver intended results"
6. "Inefficient capital allocation by Yahoo's management team"